Tag line: "The first sign you can't explain. The second sign you can't ignore. 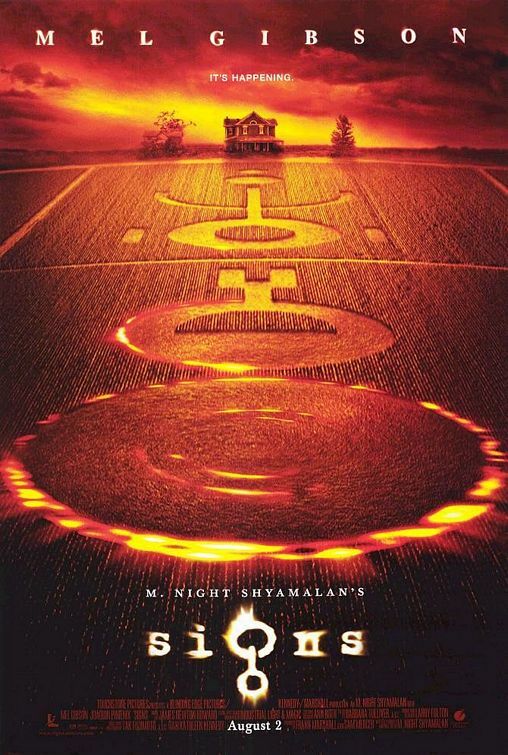 The third sign you won't believe"
With Signs, director M. Night Shyamalan has created a tense, frightening motion picture about a man who’s lost his faith in God, and is about to come face-to-face with aliens from another world. Mel Gibson is Graham Hess, a recent widower who resides in a huge farmhouse in Bucks County, Pennsylvania with his two young children, Morgan (Rory Culkin) and Bo (Abigail Breslin). Also living with them is his younger brother, Merrill (Joaquin Phoenix), who moved in following the death of Graham’s wife (she was killed while out walking one evening, when their neighbor, Ray, played by director Shyamalan, fell asleep at the wheel of his car and struck her). For many years, Graham was an ordained minister, but gave it up after his wife's death. Now, he goes through life believing we’re all alone in this world, and that there is no God. To add to his troubles, some unusual things have been happening in recent days. All the animals in the county are acting strangely, and, while out playing one morning, Morgan and Bo stumble upon some crop circles in the middle of a corn field. Is this the work of creatures from another planet? Of course not, says Graham and Merrill. That is, until similar circles start appearing by the hundreds, in all corners of the globe. And then there's the elusive intruder Merrill and Graham chased off, who managed to escape by jumping onto the roof of the house… 10 feet off the ground! In nearly every town and neighborhood around the world, people are certain the end is coming, brought about by extra-terrestrials. Even Graham becomes convinced when he has a close encounter of his own, and like everybody else, wonders if mankind can survive an invasion from outer space. Signs is a solid, entertaining science fiction tale, offering up several memorable sequences that center on its otherworldly visitors. My favorite involves a news report, which broadcasts footage shot in South America at a child’s birthday party, providing us with our first glimpse of the aliens. These moments, combined with some truly suspenseful scenes later in the film, make Signs a nail-biting, edge-of-your-seat thriller. 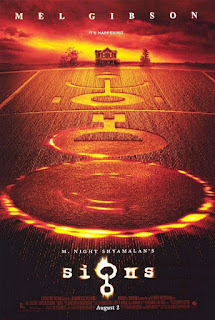 Yet, like Shyamalan’s The Sixth Sense and Unbreakable, Signs relates an amazing tale merely to support its very touching human story, about a father whose lack of faith is tearing his family apart. Gibson is wonderfully understated as Graham, a man so deeply wounded by life that he’s turned his back on his beliefs. Signs is as much about Graham’s personal dilemma as it is about aliens, and in my opinion, it tells both stories extremely well. I have to agree about signs. And doesn't it really say something about that maybe we aren't alone in the cosmos. I was scared S**tless the first time I saw it and still jump at most of the scenes with the aliens. But the best part was we did not succumb to them and it shows that we can come together as a people and survive any crisis. Dr. Shock you're the horror movie podcast host that I find myself agreeing with more than any of the others but I have to admit I recall really not liking this movie. I remember thinking that it was (aside from the stunning news footage scene you mentioned) bland and really corny. However I'm tempted to give it a re-watch after reading this review as it has been a long time since I've seen it. I'm really enjoying this site by the way, as well as being an admirable feat it's a great resource to just browse through and find out about all kinds of forgotten classics and wacky oddities.